Zapier is a great way to manage your workflow with over 1000+ zaps (Zapier apps) ready to go on their platform. 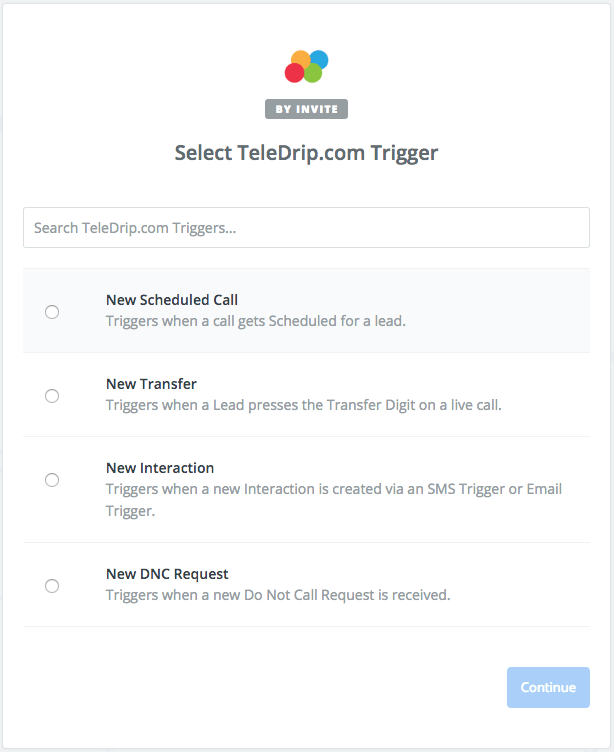 This means that with a few clicks you can sync your Teledrip schedules into your Google Calendar, or Zap all of your transferred leads into the CRM of your choice, all in real time. Zapier also offers the functionality to setup dynamic filters, “if this, then that” rule based scenarios, and much more. For this reason, we wanted to make an app with Zapier. We will always be open to integrate with any platform that could benefit our clients in anyway. You will get this API key from the API -> Documentation here. 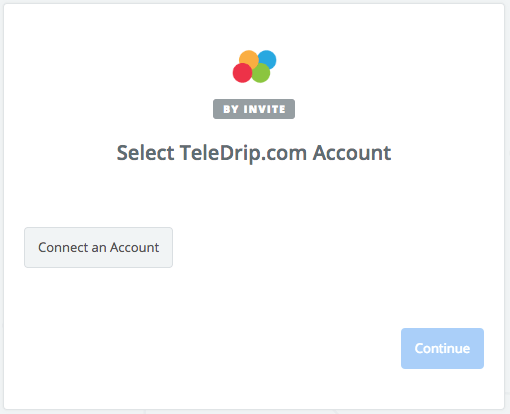 Click “Connect an Account” on Zapier and add your API key from Teledrip. 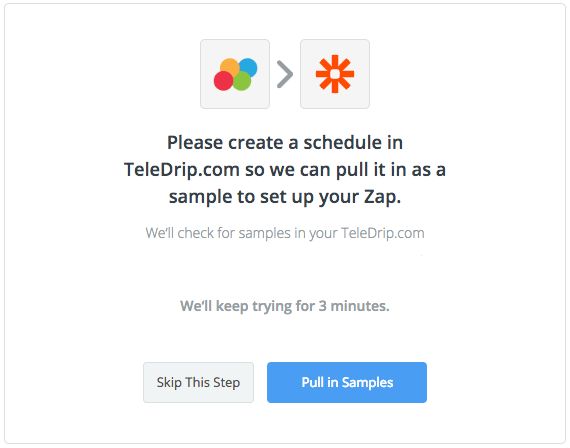 Once you plugin your API key your Zapier will be authenticated with your Teledrip account. From here, you are able to pull in sample data from Teledrip live. This is so you can verify everything is working as intended with your API token. Please note if you do not have any schedules in your account, no sample data will appear. In this case, we will skip this step, by clicking the “Skip This Step” button. Now that you understand how to create a hook into a trigger its time to set up an action. Actions are specific things you can do with the data that has been “Zapped” to you from a trigger. This means, that when a specific trigger is triggered, you can have it fire a Zap to another service using the data from that trigger. 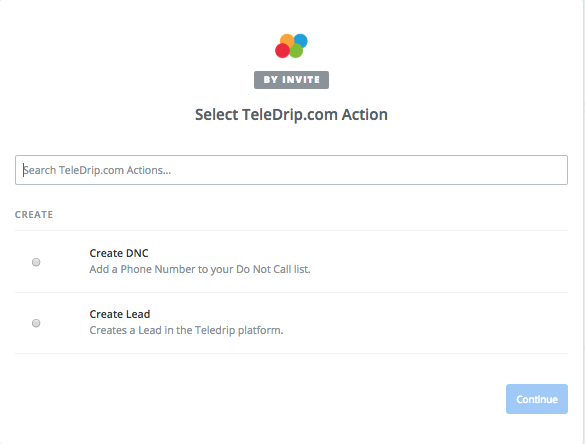 Lets create a new spreadsheet row every time a schedule is created in Teledrip by the A.I. 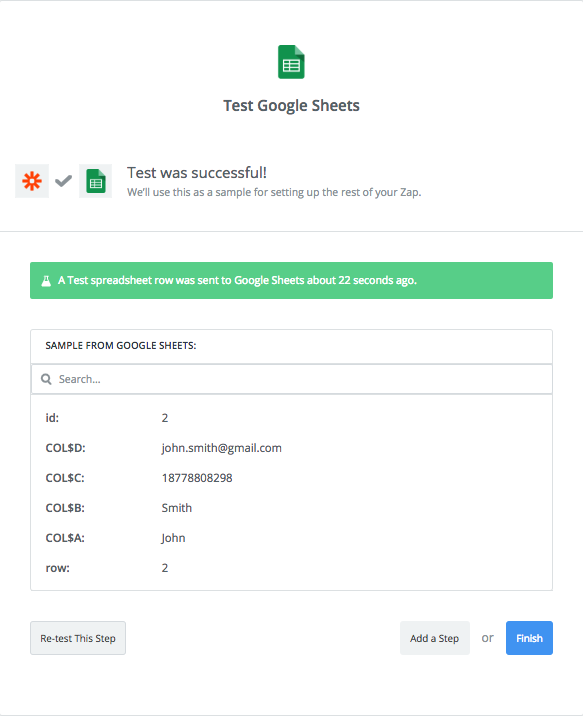 Select the Google Sheet action, and login to your Google account that has a Google Sheet spreadsheet on it. I have made a spreadsheet in my Google Sheets already that’s called “Schedules”. I also added first name, last name, phone number, and email columns. 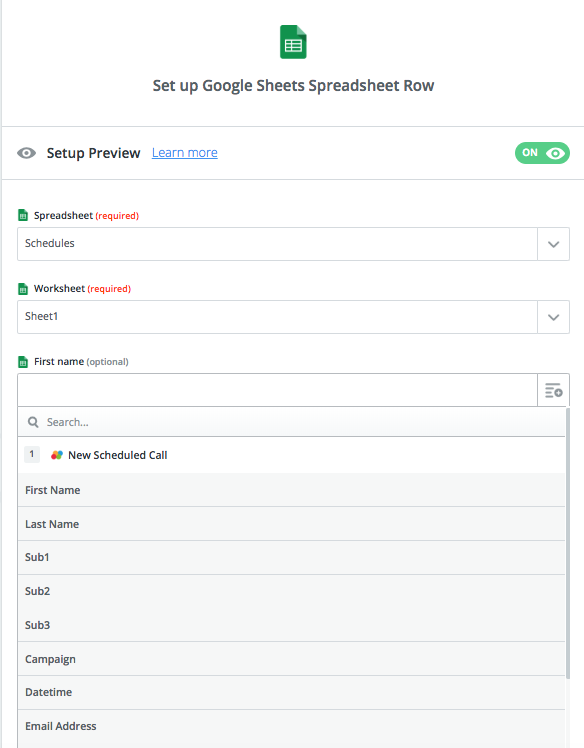 Select the Google Sheet action “Create Spreadsheet Row” in Zapier after you have linked your Google Sheet account, and have selected the Google sheet you would like to use. At this point you can start mapping all of the fields you want over to each spreadsheet column. For a listing of all available fields you can use, click the icon to the far right of each text box for a dropdown of all available options (shown above). You can choose from any of these fields. Each trigger will have different fields that you can use in your action steps. The bottom line is you can use Zapier in a variety of different ways in your workflow. You can chain together multiple zaps, to increase your efficiency, and further automate all of your business processes.